So I bought a tractor and some implements. 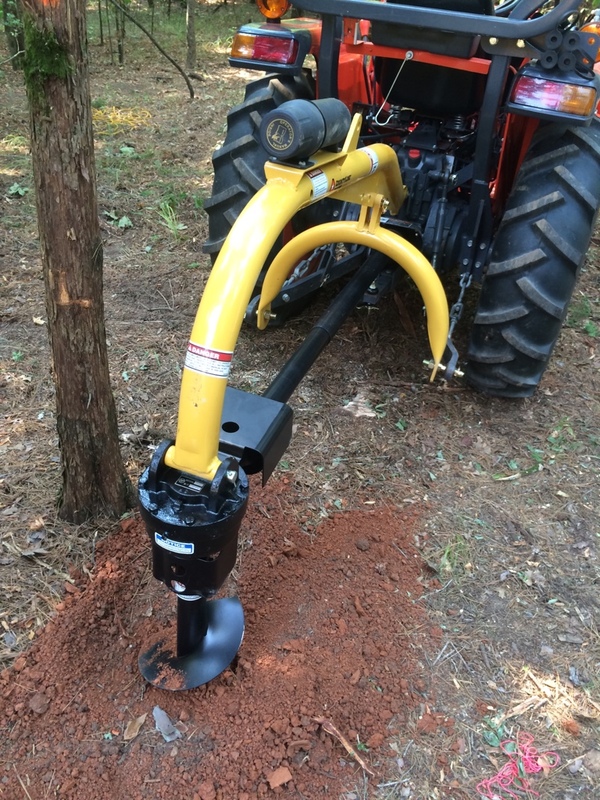 Assembled the post hole auger and went to work. Well, I think I drove the auger too hard. I was next to some trees and after about a foot I lowered the the point too aggressively and it bit hard into the clay and hit a root, snapping the shear pin (5/16 grade 5 bolt). So I was left with trying to get a stuck auger out of the ground. The PTO apparently does not have reverse and I was left trying to unstick it by hand. I put a big pipe wrench on the auger with a cheater pipe and slowly rotated it backwards for about 30 minutes a few inches at a time until it came free. Other than easing down on the auger and clearing the hole ever few inches by lifting up on the 3 point, what else could I have done differently? is there an easier way to unstick an auger? Like you said, just a few inches at a time, raising each time to clear the hole, and don't ever go full down with the lever, since most tractors don't power down anyways, it doesn't help any. I've had that happen, where it just drills into the ground....luckly for me, it was crappy dirt and my tractor could lift it out. ...oh, and lifting the front of tractor with bucket, to raise rear hydros, then lowering the front back down gently might pull the auger out next time. Oh man, I wish I had known. My tractor does power on the down stroke of the 3 point so I added insult to injury. The bucket trick I did not think of. It may have been a moot point since it was soooo far down but it would have been easier than working every muscle in my body for half an hour. I was so sore last night that I ate two of my wife's leftover muscle relaxers and passed out sitting in the chair. Woke up about 2 am and went to the bed and slept like a baby. I thought that exact thing as I was trying to unstick it and the first time I tried to attach the box blade and get all the connection points to line up. For making my life easier, it was sure a bear to get these two lessons out of the way. I think it would have been faster and easier to just use my old post hole digger (the manual one) for just 2 holes. The most powerful lift you have is likely to be the 3 point. If the auger is detached, stick the bucket lip under the auger spiral and roll back the bucket. My tractor has 5000-6000 lbs of roll back so it can pop trees out of the ground or get a fat boy off a candy bar quick! patience RN. when things happen with implements take a step back, take a knee, drink water and take a look at what is going on. yeah, Nate you are right. Even so, I don't mind working stupid. I just don't want to wind up missing a digit or limb. I can sometimes get in a hurry to get results. Ain't tractors fun. The problem is you need a bigger one. When you get a bigger one, you will push it's limit and need a bigger one again. That madness never stops so brace yourself. I'm sure you already have, but pick up a sack full of those spring clips if you haven't already. Don't get the cheap ones on the counter at TSC. Go back by the pins and grab a bunch of those black ones. They stay a lot better. Problem is getting them on without breaking a finger. I was talking about these. oh. I got the zinc plated ones. Next time I'm in there I'll pick up a few. I know they are "consumable"
Try putting a "dummy cord" on them. It will help cut down on the consumption. Not with bush hogging, I think. Bush hogging eastern, southern, and mid western forests and fields has the same approximate net result on a tractor from my experience as if you were bush hogging IED laden route Irish in Baghdad! The leash doesn't totally eliminate loss. It slows it down. 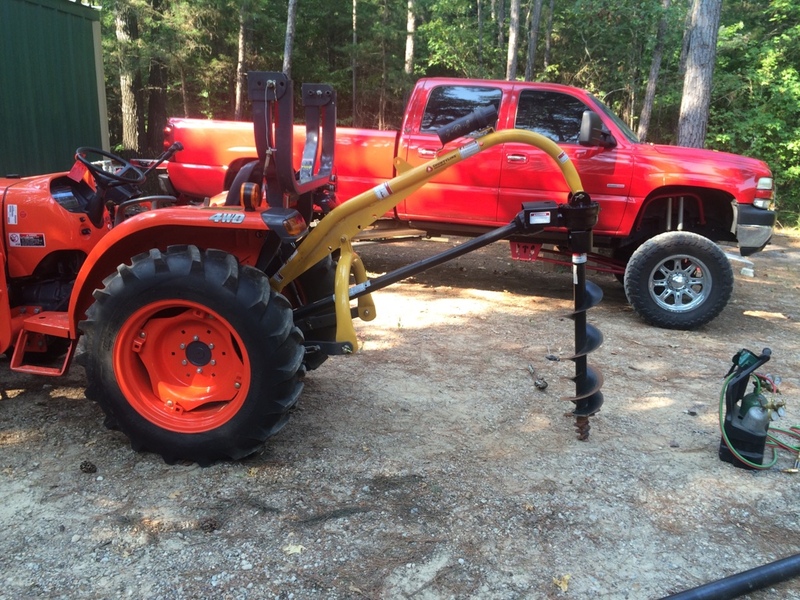 I have used (read abused) my tractor and bush hog in the same manner as everyone else. You know, like cutting anything I can make the tractor go over. I still need spares but don't go through them quite as fast. 550 cord is great. Holds strong but not too strong. I broke a steering spindle off a Case 580 once. Watch a guy out and weld it back on, then I was easier on it. That impatience we all tend to have can cost time and $$$, sometimes a little blood. Bought a 1000ft spool. I've used it for just about everything. But sometimes when using the larger bits I have actually had to dig them out. Can't say about Texas soil but up here drilling holes in the summer is like auguring into concrete. We just did 2.7 miles last week,lots of holes. We just did 2.7 miles last week,lots of holes. I think that's more than a lot of holes! And if it was all concrete style dirt that was a lot of work too!